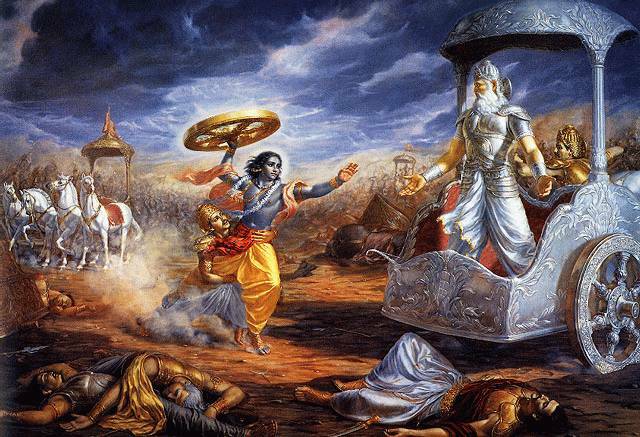 Episode 34 - The Pandavas resume center stage as the main characters of this episode. They continue their trek through the mountains until the going gets too rough for Draupadi. Bhima summons his half-Rakshasa son, Gatotkacha, who can fly, and they are carried the rest of their journey to the Ashram of Nar-Narayan. While hanging out at this heavenly retreat, Draupadi sends Bhima off to find her some special lotus blossoms. Along the way, Bhima meets up with Hanuman, who it turns out is his brother (both are sons of the Wind God). The quest for the Lotus Blossom finally leads Bhima to Kubera's Pleasure Garden, which is guarded by hordes of Rakshasas. Bhima makes short work of them and takes a dip in Kubera's pond. Yuddistira gets suspicious and has Gatotkacha take them to Bhima. Kubera takes the destruction of his gardens and the death of his guards pretty lightly, and he allows the Pandavas to stay in his garden as long as they like. We leave them there until next Episode, when Arjun finally makes his return.